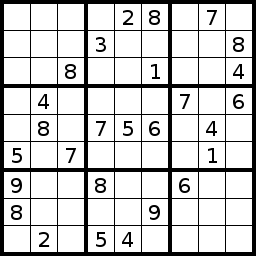 Sudoku is a logic based number placement game that was invented in the US, then popularized in Japan before spreading to the rest of the world. 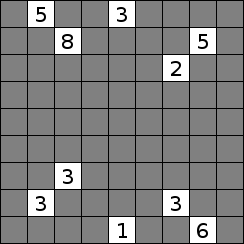 The goal of the puzzle is to place digits 1 through 9 such that each row, column, and 3x3 box contains exactly one of each digit. Netwalk is a rotational puzzle game. 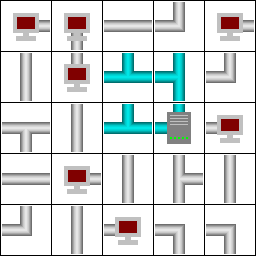 You are given a network of computers, but all of the pieces have been randomly rotated. Rotate all the pieces such that all the computers are connected to the server, there are no lose ends, and all of the pieces are in use. TenPair is a game of logical elimination. The goal is to clear all the digits from the grid. You clear digits by eliminating two digits that are a matching pair or that sum to 10. They can be eliminated if they are in the same column with no other digits between them, or if they have no digits between them when scanning the grid from top to bottom, left to right. That is, the right end of a row wraps to the left end of the following row.